This guide of CannonSatoshi Bitcoin faucet game provides a walkthrough of its several sections and also analyze how much can be earned playing this strategy game, with tips, hints to progress quicker in the game. CannonSatoshi Bitcoin faucet game is the latest release from Game Vault Studios, which has developed to FarmSatoshi, their succesful Bitcoin faucet game. Besides a faucet game, CannonSatoshi is also an invest based game since it is possible to buy some gems which allow to speed up the construction of the satoshi producers (the cannons) in the game. The concept of the game is much simpler than FarmSatoshi: Buy cannons to bomb the village, loot the mine and earn free satoshis. Those cannons require oil to function, therefore the warehouse of oil must be filled periodically. Note: the game allows to withdraw satoshi using 2 options: via Xapo and via FaucetBox. In case of using Xapo, it is strongly recommended to register at CannonSatoshi using the same email address as used toregister at Xapo. The player starts the game with 35,000 satoshi available (as shown in the satoshi balance atop of the page) to be invested purchasing and upgrading the cannons. To the right of the satoshi balance there is a meter of the oil amount in oil warehouse, and if clicking the plus icon we browse to the oil purchase page (cost of oil is 1 satoshi per unit), where we can also upgrade the size of the fuel warehouse. Besides, to the right of the oil meter, there is a counter of the gems the player has, and after registration the game provides 50 gems to be used to speed up the cannons construction and upgrading (since they require some time, so they get built/upgraded). Finally to the top right part of the page (under the nickname used when registering to the game) there is a counter of the points earned while playing the game. performing certain actions in the game will require to have a minimum amount of points scored, as we will see below in this article. The main page of CannonSatoshi game shows a village surrounded by 24 slots where player can place the cannons. These cannons can be destroyed, if needed. Top icon: it shows a ranking of players. The players are ranked based on their current earning potential which is the satoshi/hour that can be looted from the mine with all the cannons they possess running at full capacity. Keep improving your cannons and don’t forget that while under construction, the cannons are not looting any satoshi. Achiv icon: This is a list of a varied amount of achievements we can get as playing the game, and which provide some rewards (satoshi, points, gems) to help player progression. 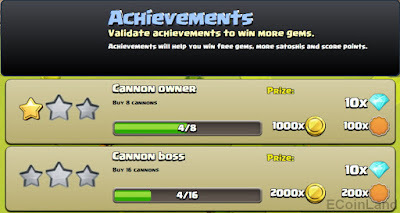 These achievements are related to: the amount of cannons types built or upgraded; how much referral earnings have been got; which level has the fuel warehouse been upgraded to; amount of oil that has been bought; how many gems have been purchased in the invest section of the game. Home icon: click it to display the village and the curret set of cannons deployed there. Bank: In the bank you withdraw your earnings in satoshi and you can get a daily bonus. There are two options to withdraw, using Xapo and using Faucetbox. Besides, we can get a satoshi bonus between 20 and 2000 satoshi, every 8 hours. It is recommended to claim it as much as possible since it will be very helpful, specially at start. 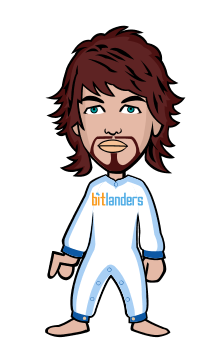 Profile (the avatar icon): check here the game account related info, including how many points have been earned, the rank in the top of players, and the current gross satoshi production. There is a choice to reset password of the account. Gem (with a plus): this section allows to invest to game, by purchasing gem packs. 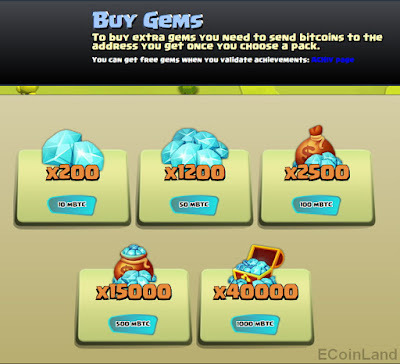 To buy extra gems you need to send bitcoins to the address you get once you choose a pack. Remember that you can get some free gems by completing some achievements. The smallest pack of gems (200 gems) costs 1 million satoshi. I icon: Some CannonSatoshi game information. Now let's describe in a nutshell how to build and upgrade the cannons, but before that, just point that the village (the server) is started with a mine worth 2500 Bitcoin. - All players are looting the same mine to earn free satoshi. Players race to buy cannons and level them up. Each cannon is constantly shelling the mine and looting the free satoshi, as long as the fuel warehouse keeps some oil. There are 6 types of cannons and each cannon has 8 levels. Cannons need fuel to function at full capacity and earn a maximum number of satoshi. 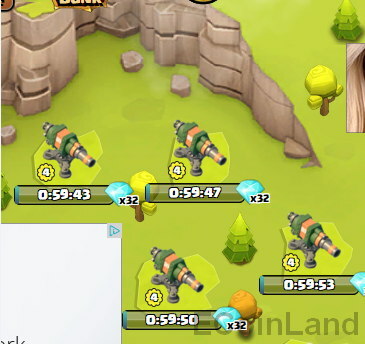 - To buy and place a new cannon, just click over a free slot in the village display at home page. There are 6 types of cannons : CANNON, BOOM CANNON, FLAMETHROWER, MACHINE GUN, MORTAR and ROCKET LAUNCHER. There is a minimum score points requirement before you can buy each cannon. Cannons need a construction time to become operational. You can use gems to speed up the construction time (while there is a counter which shows how much time is left before the cannon is ready). - Level up your cannons: click over a cannon. 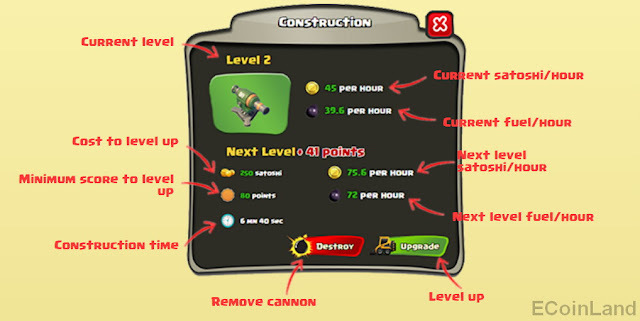 Each cannon can be improved from level 1 to level 8. Enhanced fire power and higher earnings come with higher levels, though there is also higher fuel requirement. There is a minimum score points requirement to level each cannon. Cannons need a construction time for the enhancement to take place. You can use gems to speed up the upgrade time. If you prefer to free the space for a superior cannon, you can destroy the current one instantly. Let's describe in more detail, and analyze how to progress in CannonSatoshi in the most efficient ways. - To earn the free satoshi, just build cannons, and upgrade them to earn more. Additionally we may get some extra free satoshi once completing achievements, and also by visiting the bank page every 8 hours to get the bonus. This bonus (60-6000 satoshi/day) will be very important, specially at early stages of player's game. - The points score shown at the top right of page is very important to progress in CannonSatoshi. It determines which cannons can be bought, how much can they be upgraded, and also how big can the fuel warehouse be upgraded. 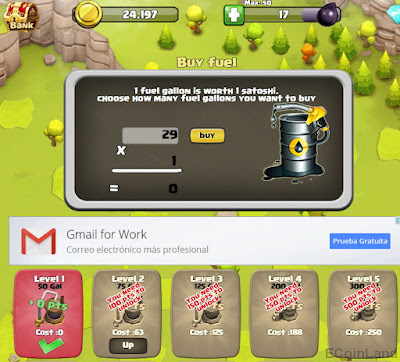 We can earn score points in several ways: the main way is by buying cannons and upgrading them; upgrading fuel warehouse and completing achievements also provide some score points. Therefore, besides focusing on getting bigger earnings, we must focus too on getting enough score to unlock new features. -Besides, there is the fuel management. It is very important to log in to game and buy oil, as much as needed so as the fuel warehouse never empties. Depending how many cannons and their level, this task might require frequent (even hourly) access to game. Note: sometimes, there appears an antibot captcha while buying oil, so complete it just to avoid any banning action upon account. - Despite higher levels of the Cannon provide more gross satoshi, it is worth mentioning and focusing on the satoshi net earnings, since level 2 and level 3 Cannons provide less satoshi net earnings than level 1 Cannon! Level 4 cannon provides equal satoshi net earning (but a much higher fuel consumption!13x-15x times higher oil consumption! ); after that, level 5 and the next ones provide higher amount of satoshi net earning. Hint: therefore, if you have to upgrade a cannon, earn satoshi and do it straight to level 5 (at least). - Let's check the efficiency of the fuel/oil used for the net satoshi earnings (earning after subtracting the cost of consumed oil). If dividing the satoshi net earning by oil, we can notice that the most efficient cannon level is the level 1 of each cannon: at level 1, all cannons provide between 1.44 (the BoomCannon) and 1.57 (the basic Cannon) satoshi per fuel used. + Every level 2 cannon of the six types provide SAME lower performance: 0.14 satoshi net earning per fuel consumed. So, level 8 cannons are less efficient than level 1 cannons of the same type. Still they will provide in the end higher earnings, but we will need to upgrade oil warehouse drastically to log in to game and refill oil warehouse at "reasonable" frequency. In the end we will just want to place Rocket Launchers because the satoshi net earning maginute which is the highest (3500 satoshi/hour net earning, at level 8), but other than that, it is not more efficient in oil usage than basic Cannon, and we will have to watch carefully the oil warehouse to keep it running as much time as possible. -The ROI (time to break even the cost) of a level 8 cannon, of any type, is 140 hours. A matter to consider if having in mind to destroy cannons. 1) level 5 Cannon requires to have already scored 1000 pts. ; it costs 5602 satoshi (subtotal of satoshi spent purchasing the cannon and upgrading to level 5); it produces 162 satoshi/hour, and the oil required per hour is 136.8, so the satoshi net earning is 25.2 satoshi/hour. The subtotal of score points earned purchasing and upgrading the cannon is 626. 2) By other hand, level 1 Flame Thrower statistics: it requires to have already scored 250 pts. ; it costs 6300 satoshi; it produces 37.5 satoshi/hour, and the oil required per hour is 15, so the satoshi net earning is 22.5 satoshi/hour. The score points earned purchasing the cannon is 73. 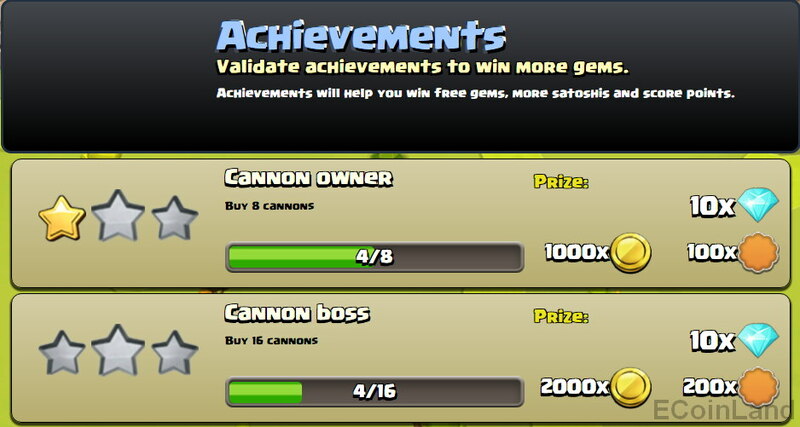 Both cannons' satoshi net earning is similar (25.2 satoshi /hour over 22.5 satoshi/hour, for the level 5 Cannon). 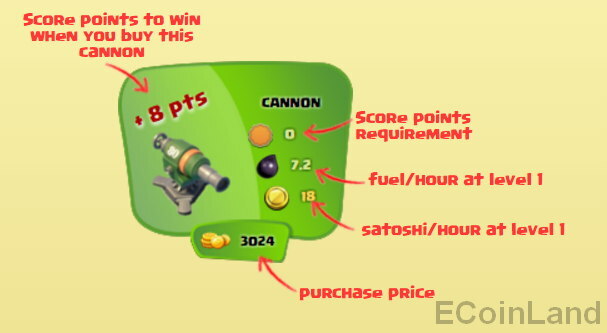 The advantages of level 5 Cannon are that it yields a much higher amount of score points (626 over 73), and that the gross satoshi earned per hour is also very high (162 over 37.5) compared to level 1 Flame Thrower.If calculating the ratio of how many satoshi are spent for each score point received, the ratio for each type would be: 8.95 satoshi spent per score point gained, for level 5 Cannon; by other hand, each score point got by level 1 Flame Thrower costed 86.3 satoshi. This comparison ratifies the idea that to net score points quickly, in the beginning of the game, we may upgrade our Cannons, instead of just saving for more powerful types of cannons. So, in the short run, level 5 (or higher level Cannon) Cannon will help netting score points to unlock other features in the game, and also it will help to rank higher in the Top ranking of players. Back to Flame Thrower, the main advantage of level 1 Flame Thrower is that fuel consumption is much lower than Cannon's one (15 oil/hour, much below than the 136.8 oil/hour for level 5 Cannon - almost 10x lower), therefore, it helps keeping low the fuel needed per hour. 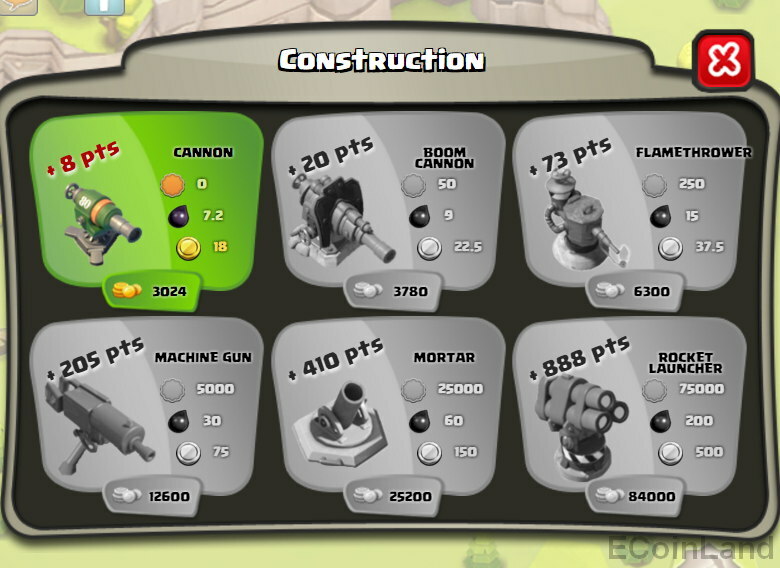 Building and upgrading lower types of cannons may help scoring quickly enough points to unlock other more profitable types, higher levels, and also larger oil warehouse, but in the end the idea is to just build the minimum amount of lower types of cannons (Cannon, Boom Cannon, ...)to earn the required score points and net satoshi for the most profitable ones (Mortar, Rocket Launcher). 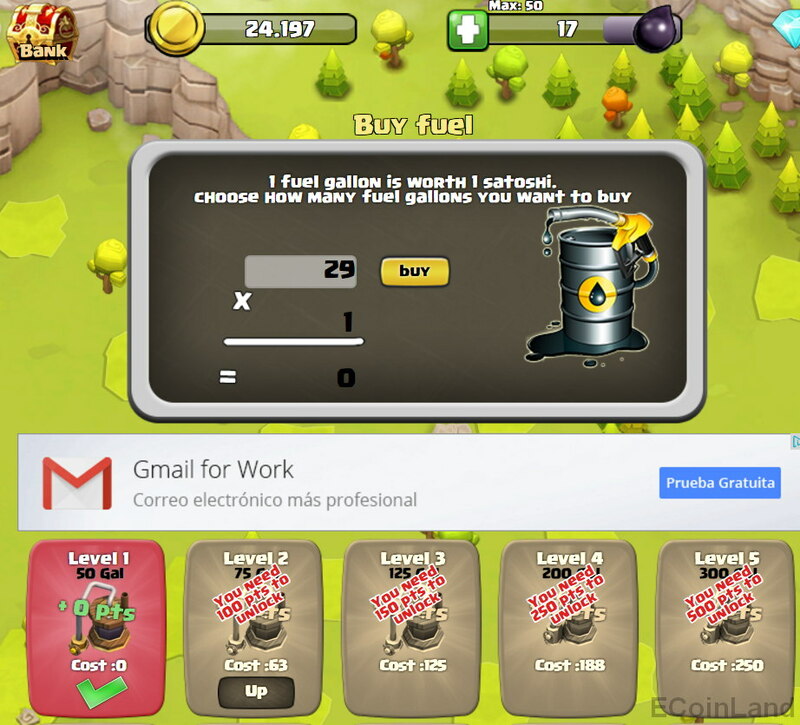 Upgrading fuel warehouse will help adding and upgrading cannons, and also it will set how often we must log in to CannonSatoshi, to refill the warehouse of oil. The warehouse may be upgraded 35 times, and each level requires that we may have already scored a minimum anmount of points, besides some satoshi cost. Each upgrade will provide some score points to our balance. A play field full of 24 level 8 Rocket Launchers would ask a level 35 oil warehouse to be refilled every 3 hours and 12 minutes. To get an idea of how important is to control fuel consumption, keep earning score points and upgrade enough the oil warehouse let's see the next example. consumes 863 oil units/hour, and has scored (with a small help of achievements, and warehouse upgrades) a total of 6122 score points. Such score points allow to upgrade oil warehouse up to level 8, for a size of 2000 gallons of oil. This size will allow to refill the oil warehouse every 2 hours and 19 minutes. Before having in hand all the information about all levels of cannon types, this new game CannonSatoshi, from FarmSatoshi creators, looks promising. FarmSatoshi is currently one, if not the best Bitcoin faucet game around, which provides much entertainment, earnings, and guarantee of getting paid what we earned so hardly. as a novelty, there is the choice to invest in the game, yet to find out how it will affect in the progression of game, and also which is the estimated ROI of any Bitcoin amount spent purchaing gems.